This may be the single most mesmerizing episode of Grape Encounters Radio ever, and we think you will probably agree with us. This week, in a reprise from 2017, Grape Encounters Host David Wilson takes you to the home of legendary winemaker Michael Mondavi, co-founder of the world’s most recognizable family brand. When Michael teamed up with his father Robert and brother Tim, the California wine industry was forever changed. The Mondavi family not only took the lead role in making the Napa Valley a household word, they also proved to the world that California could deliver quality second to none. The Mondavi family’s story is legendary… and most wine aficionados know much of the story quite well. 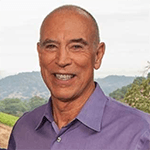 In this interview, Michael Mondavi candidly fields many questions that he has never been asked before and, upon hearing the interview from start to finish, your perspective on wine will never be the same again. From tinkering with your wine to some very eye-opening thoughts on why restaurants don’t want you to suffer through a bottle that doesn’t please you, Michael tells it like it is with unparalleled insight and a perspective that is truly inspiring and purely delightful. This one-on-one conversation will draw you in instantly and have you begging for more. It’s a conversation you’ll want to listen to more than once. If you want to be liberated from conventional wine-drinking wisdom by one of the greatest winemaking masters of all time, let this episode of Grape Encounters whisk you away to where you’ve never been before.